Hi everyone, I am looking for some new squid recipes. I do mine a couple of ways, flour, egg and breadcrumbs then deep fried for a minute or two. the other is more popular and is an Italian method. 2 or 3 squid hoods and tenticles. this recipe is fine for just tenticles or just hoods also. a handful of fresh parsley finely chopped. a pinch of salt optional. mix all ingredients together in a airtight container. clean your 2 or 3 squid, tenticles are good to add in. Cut the hoods into rings and the tenticles into bight size bits. Boil in satled water for 30-40 mins, (up to 60 mins is fine for melt in your mouth tenderness). drain and cool. straight away but 2 or more hours in the fridge is way better. can be left in the fridge for a few days. Quick, easy and pretty good. Looks awesome mate, just on Chorizo an excellent summer dish I knock out and pass around with drinks. Cut up as you have there hot pan and seal off then tip in at least half a cup to a cup of a good cider and let it reduce to a sticky sauce. Insane! Both sound great. Just gotta get out there and catch a few to try out. I do occy a similar way. I was put onto this last year, just crush the kiwi fruit up, up, leave rings in for at least 20 minutes, then cook however. The only way I've ever seen the inky little suckers tenderised, and I reckon I'd tried it all over the years. We breadcrumb them and deep fry mostly, but sometimes just salt and pepper squid. Will be trying a couple of the suggestions on here I think. 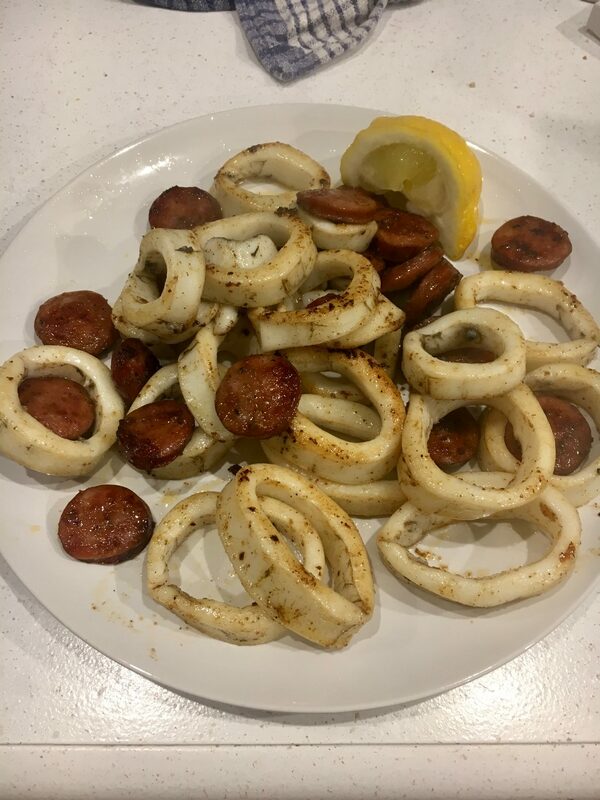 Master butchers (MBL) in Perth sell bags of chicken coater and I have found mixing half chicken coater and half plain flour and just throw squid rings straight in. then shallow fry in a pan for a few minutes until golden brown. More coater if wanted a bit spicier but is similar to KFC coater like a cross between popcorn chicken and hot and spicy. i get it sent to SA by my family as I rate it highly. cut the tube flat. finely slice it up and coat in flour. in a pan heat up butter and a bit of olive oil to stop the butter burning as easy . throw in some finely chopped garlic , jar stuff will do. get the pan hot and throw in the squid constantly tossing it around. if fine enough it will only take a minuit. Just tried the boiled squid with marinade with squid we caught today. Very tender, splash of vinegar when eating went well.